One northern Spring event that is little-known outside of the North is the herding of reindeer, from inland near Inuvik to an island near Tuktoyaktuk, a coastal community on the Beaufort Sea. The Canadian government introduced reindeer from Russia to the Northwest Territories back in 1935, as an alternative food source when caribou became in short supply. In a circuitous journey that involved being shipped from New York, west to Seattle then north to Alaska, approximately 3,400 animals were herded back down south to the Mackenzie Delta. Descendants of some of the local herders who helped to bring that original herd down are still herding their progeny today. Some Saami herders also accompanied that herd from Europe to Canada and stayed on. As a child I learned about the Saami people (who were called Laplanders at the time) and their reindeer. Growing up in the Caribbean, a reindeer was as foreign as a polar bear. Who knew that I’d end up living close enough to both creatures that neither one causes me to bat an eyelid, anymore than I would have at an iguana? The herd has been maintained for all of these years and at one time numbered as many as 8,000. The demand for reindeer meat fluctuates inversely with the caribou population. In the Spring, the reindeer are herded to Richards Island, which is their summer grazing and calving grounds. They’re a free-range herd and although reindeer can swim, apparently they don’t need to be watched while on the island. However, once the ice is thick enough that they can walk on it, they need someone to keep an eye on them. In 2008 they walked back to the mainland after the ice had formed and they wandered off before the herders returned to get them. How do you lose a herd of reindeer? By being late, I suppose. The territory is so vast that where do you even begin looking for them? If they had been caribou, the wild side of the family, they’d probably have been lost forever. But the domesticated reindeer were eventually rounded up. Meanwhile, back down south in Yellowknife, March is the month that is synonymous with a state of increasing happiness. I don’t think that it has anything to do with the official first day of spring. That is almost a non-event, because the happiness factor takes over long before then. Even the sun seems to be happy. I never paid attention to the sun when I lived down south, because I barely even noticed it due to the cluttered skyline and smog. But in the north I’m much more aware of it and how it moves, because it plays such an important role in northern life. It can be endlessly in your face or nowhere to be found, and it seems to have a personality. Three months ago it was labouring to get out of bed and grumpily clocking in to work but accomplishing nothing – not making it over even low-rise buildings, casting more shadow than light – then clocking out after barely a half-shift. Now it springs out of bed with gusto, streaks high into the sky and on the days when it doesn’t appear to be smiling, it’s giving a mischievous wink, or positively laughing giddily. I swear it would do cartwheels and take selfies if it could. I am always surprised that I can feel its heat so intensely, despite temperatures predominantly still below zero and ice and snow covering the ground. Some days I have to turn down the heat and open the windows because it feels like summertime indoors. I suspect that this is why people are in such great spitits and so full of energy during March events. 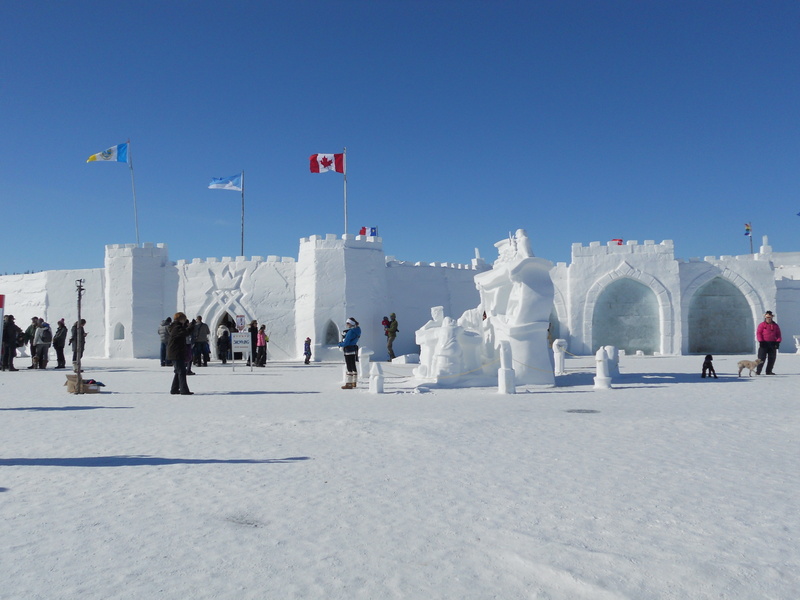 Yellowknifers know that when March rolls around, like clockwork, the snow castle on the Great Slave Lake will throw open its doors. Even though this is the 5th year that I’ve been to the snow castle, it never gets stale because it’s a different design every time. It’s simply a rite of life in the ‘Knife. This year it is much bigger than in previous years. This year the weather has also been the warmest of all my visits. It was 2 degrees Celsius when I went, which was about 30 degrees warmer than the same time last year. 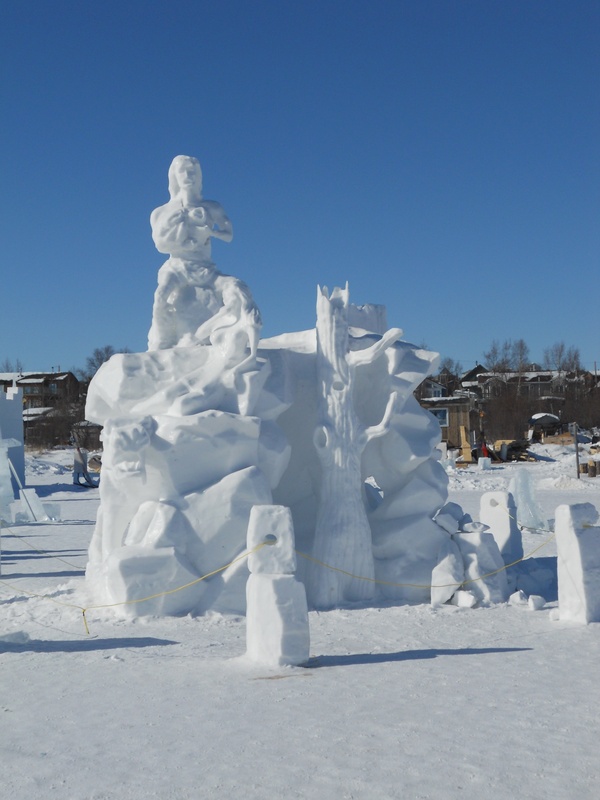 This time the sun was blazing with giddy laughter and the snow sculptures seemed to be feeling the heat, because they were shiny with moisture, their features less clearly-defined and even showing signs of crumbling. Another occasion for March happiness is the Long John Jamboree, held a few yards away from the snow castle. Two years ago I popped in and I thought I was going to freeze to death in the vicious wind, so I lasted about 20 minutes before fleeing to the car that I had left running. Last year the temperatures were even more frigid so I skipped it entirely. 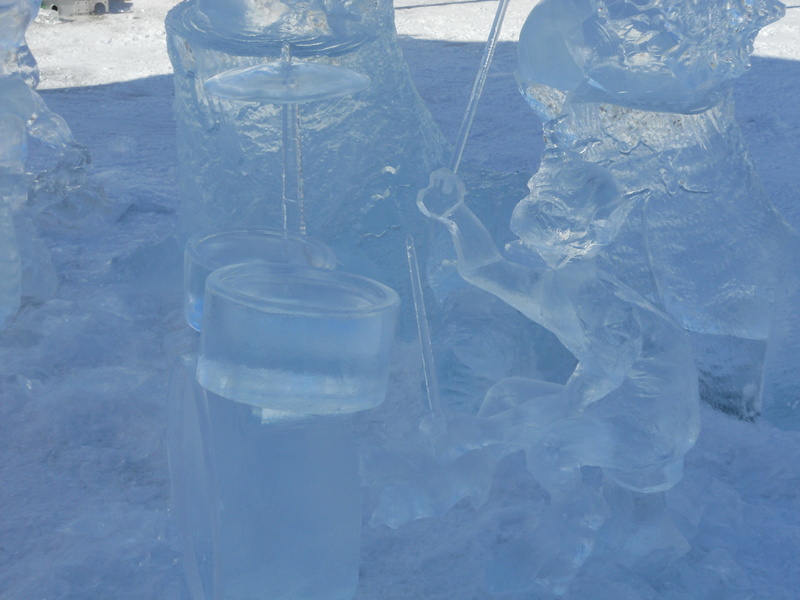 But with this year’s practically summerlike weather, it was easy to leisurely stroll through, to see what was new from the last time that I chronicled the Frozen Fun in the Sun. A particularly funny event this year was the Northern Sled competition. 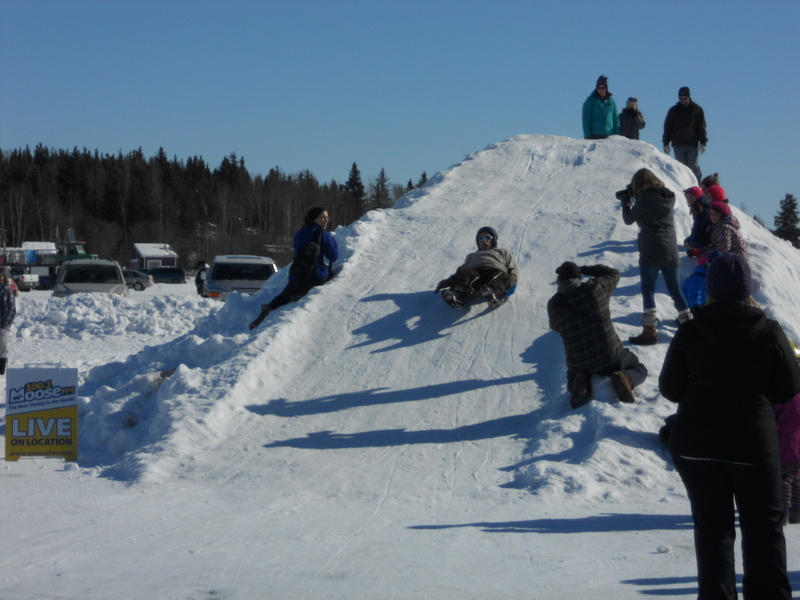 Participants created their own sleds and raced them down a man-made snow hill, competing in various age categories. 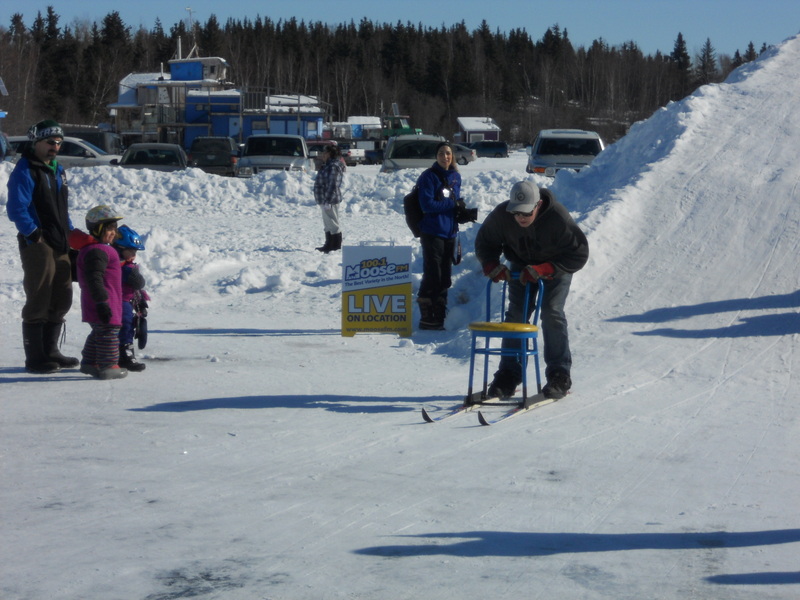 Prizes were offered for best northern sled, best home-made sled and farthest distance travelled. The designs were rather creative. 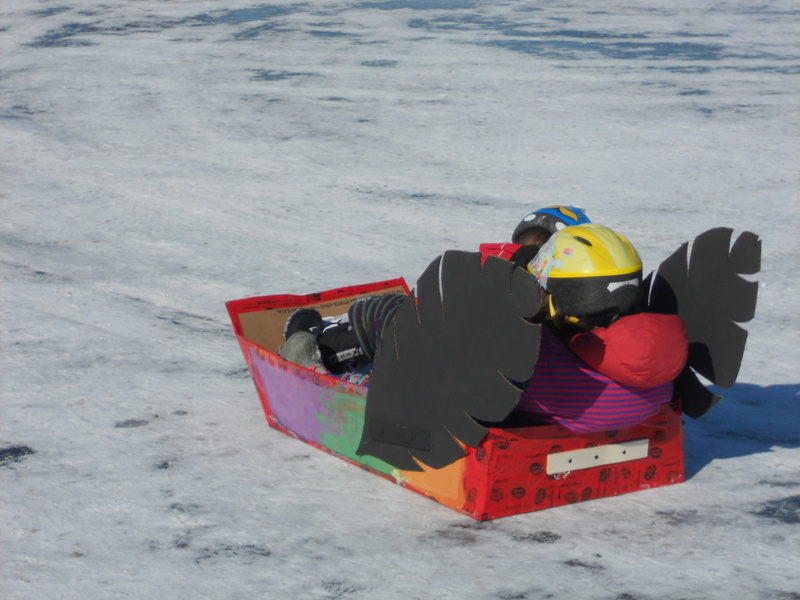 There was a winged sled, essentially a cardboard box with wings. As any child will tell you, you can’t beat a simple box for a good ride, and it also satisfies the parental requirement for stability while in motion. I didn’t stick around for the results, but I’d have given this one the prize for stylish yet functional simplicity of design. 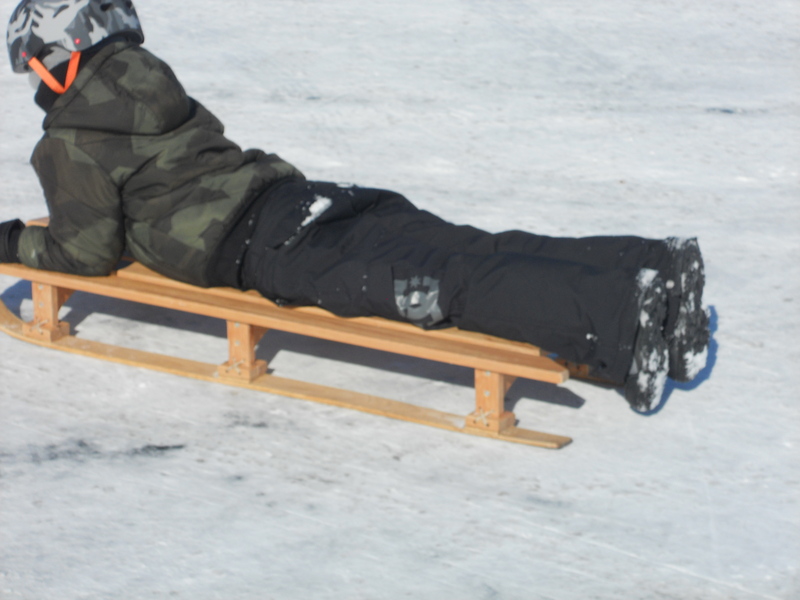 In the adult category there was the stand-up chair-on-skis sled, which was the epitome of home-made. Had there been someone sitting in the chair, it might not have travelled quite as far as it did, stopping only when it bumped into the snow barrier at the end of the course. Some intrepid sledders put on their hockey helmets and zoomed down the hill head-first. Others fearlessly shot down luge-style. No two sleds were alike. The only common factor was that all of the competitors had a good time. 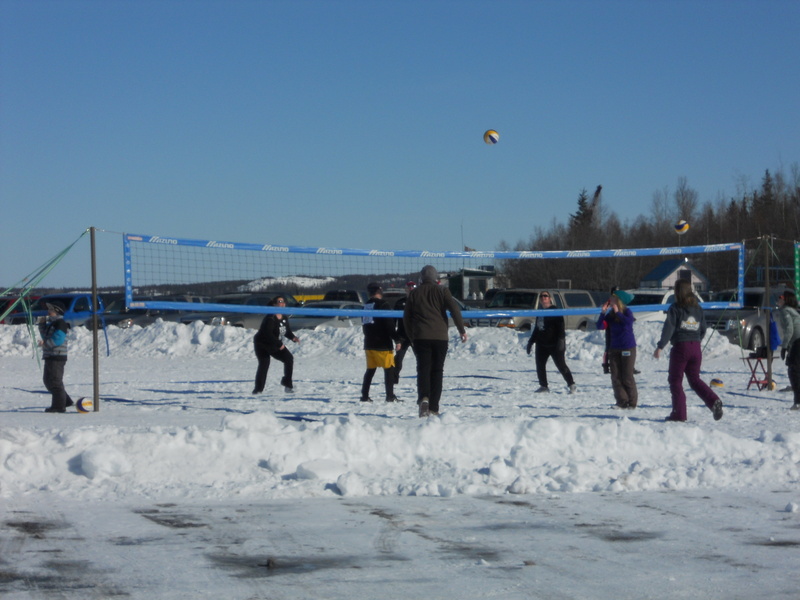 Nearby were two snow volleyball courts, full of avid players who seemed completely oblivious to anything else that was going on. 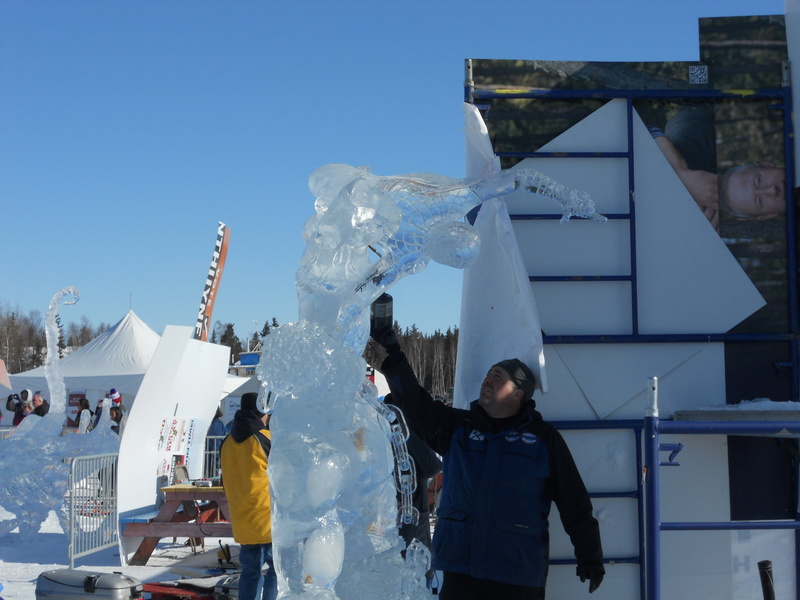 I passed by the Inspired Ice carving competition just as the carvers were running out of time to complete their masterpieces. The sun was so hot that sun-shields had been mounted to prevent some of the sculptures from melting and others were covered until the judging began. 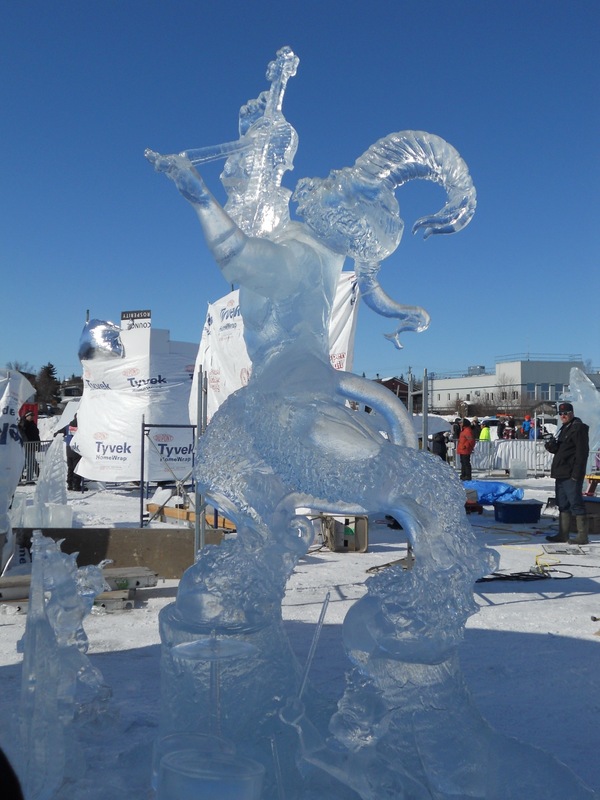 This was in marked contrast to the last time I took in this competition, when it was so cold and windy that even experienced carvers had trouble keeping their fingers working. I liked the intricacy of this fiddler, and the little devil accompanying him on the drums at his feet was a cheeky touch. The jamboree attraction of special interest this year was the chance to take a hovercraft ride…at least that was what was advertised. However, rides turned out not to be available, apparently due to insurance concerns. So, quite the anti-climax, all we curious folks could do was to look at the hovercraft and use our imagination. The owners plan to offer sightseeing tours on the lake year-round: over the water during the warm months and, when the lake is frozen, over the ice and snow. 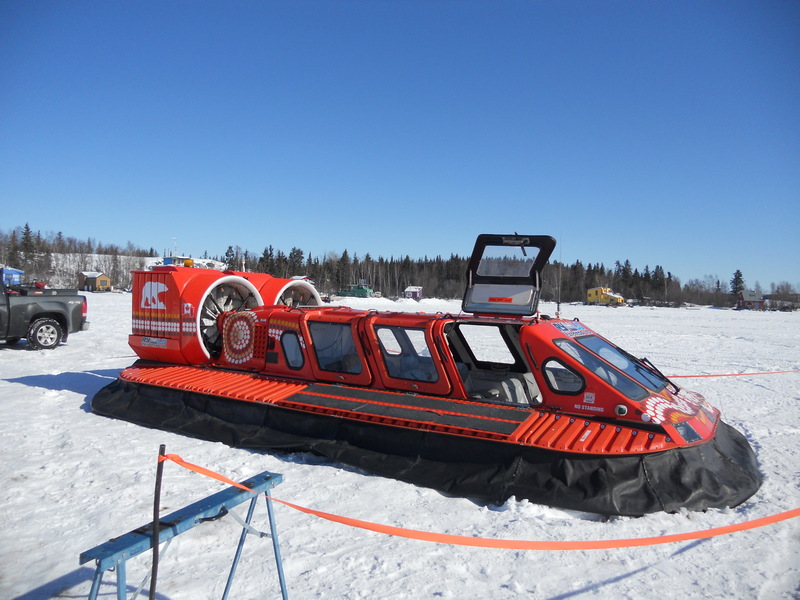 The craft can travel over land, ice, snow and water. Underneath the air cushion is a basic boat, so if it were to lose power in the water, it would float. Perhaps it will be up and running this summer and both YKers and tourists can enjoy a ride. As is customary on the Saturday night of the jamboree, the big event is the Burn on the Bay, where a wooden structure is set alight in a rather captivating bonfire. 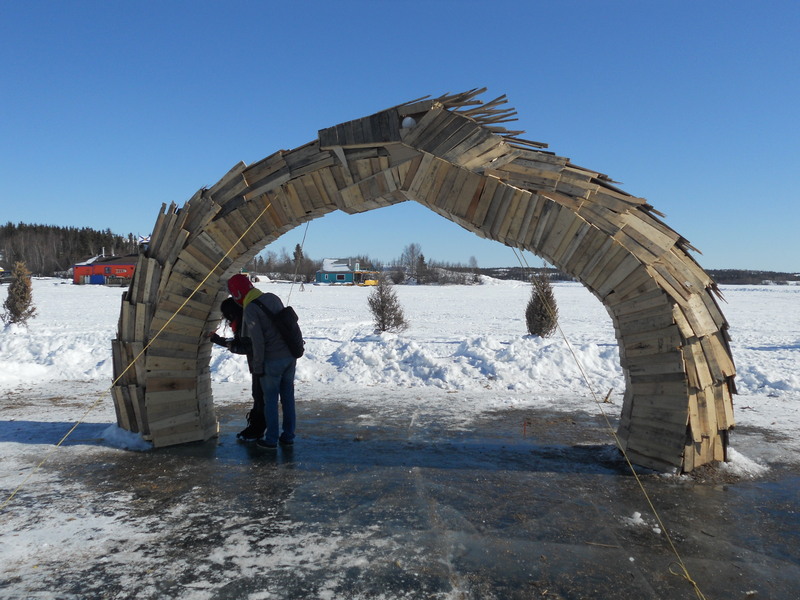 This year the theme was “rebirth” and the structure was an ouroboros – a snake eating its own tail. People were encouraged to share their thoughts on rebirth by writing messages on it. It was a fitting theme for this time of year…and the sun certainly seemed to be very happy about it.